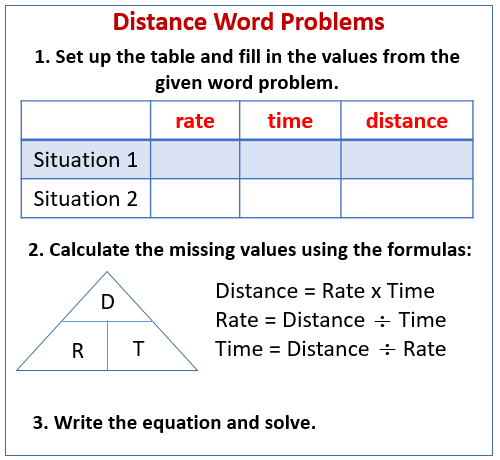 The following diagram shows how to solve Distance Word Problems using a table. Scroll down the page for examples and solutions. A bus traveling at an average rate of 50 kilometers per hour made the trip to town in 6 hours. If it had traveled at 45 kilometers per hour, how many more minutes would it have taken to make the trip? Let t = time to make the trip in Case 2. Step 5: Beware - the question asked for “how many more minutes would it have taken to make the trip”, so we need to deduct the original 6 hours taken. Answer: The time taken would have been 40 minutes longer. How to solve different types of distance, rate, time problems? The following examples illustrate three types of problems involving distance, rate and time: opposite directions, same direction and roundtrip. Lea left home and drove toward the ferry office at an average speed of 22 km.h. Trevon left at the same time and drove in the opposite direction with an average speed of 43 km/h. How long does Trevon need to drive before they are 65 km apart? Maria left home and traveled toward the capital at an average speed of 80 km/h. Some time later, Imani left traveling in the opposite direction with an average speed of 45 km/h. After Maria has traveled for six hours they were 705 km apart. Find the number of hours Imani traveled. A passenger train traveled to the repair yards and back. On the trip there, it traveled 68 mph and on the return trip it went 85 mph. How long did the trip there take if the return trip took four hours? A submarine traveled to St. Vincent and back. It took three hours less time to get there than it did to get back. The average speed on the trip there was 30 km/h. The average speed on the way back was 20 km/h. How many hours did the trip there take? Micaela left the hardware store and traveled toward her friend's house at an average speed of 25 km/h. Nicole left some time later traveling in the same direction at the average speed of 30 km/h. After traveling for five hours Nicole caught up with Micaela. How long did Micaela travel before Nicole caught up? A passenger plane left New York and flew east. A jet left one hour later flying at 280 km/h in a effort to catch up to the passenger plane. After flying for seven hours the jet finally caught up. Find the passenger plane's average speed.